At a time when airshows seem to be thinning in numbers in Europe, it's great to see new entries on the calendar appear. And appear Paris-Villaroche Air Legend did, offering one of the strongest warbird and vintage lineups to be had in Europe, roaring out of the gates with a blinder of a programme that brought many from all over the continent to witness. 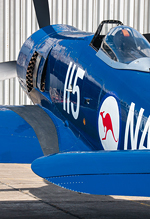 The show had an extremely strong opening edition, with unique and rarely seen machines from France and abroad, which certainly promises to set the event on the warbird calendar going forward. 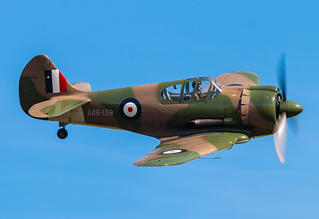 Sam Wise travelled to Melun-Villaroche Aerodrome for UK Airshow Review. Photography by the author. 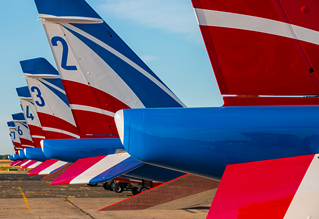 We said it with La Ferté-Alais before, but the French really get airshows. 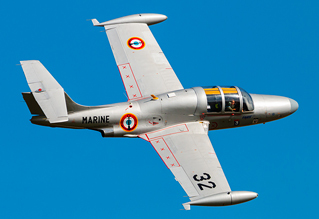 Paris-Villaroche Air Legend is part of a new brand of French shows staged by a partnership of two former military personnel, JM Airshow. Experience gained over the last couple of years has clearly culminated in a lot of airshow nous, because as early as March this year the show was starting to get noticed with regular updates on social media promising a very strong gathering of vintage aircraft. As the months passed the list grew and grew, every now and then a real gem being added - not just French aircraft but a sizeable contingent of British and Swiss machines also taking part. The end result was a real stand out programme of warbird flying, up there in terms of variety and reach as La Ferté or any Duxford show, with many items not to be found on this side of the channel for sure. Sadly, what was without a shadow of a doubt due to be the star item, the Mistral Warbird's F-86 Sabre which would have been making its European debut, was left stuck in the US for some administrative reason, but its replacement - Trachsel Charles' Grumman Avenger, complementing the French example F-AZJA - was hardly unwelcome. 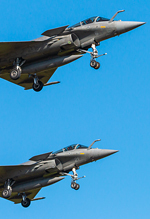 Melun-Villaroche isn't a stranger to airshows but it's been a good ten years since a sizeable display was hosted at this venue, so to get so much right first time is a pretty commendable achievement. It's certainly a strange venue for a show, though. The place isn't without a considerable and storied history. Serving the French, Germans and Americans variously during the war, the aerodrome is most famous for being the site of so many French test and prototype aircraft, from the Mystere to the Etendard, even the VTOL Mirage IIIV - as well as the manufacture location for many famous engines such as the SNECMA M53 and M88. However, as a location for a public show in 2018, it is a little run down - the hangars are rusting and battered (though still perfectly serviceable), the concrete is torn up and broken, the whole place feels just a bit dilapidated. Not exactly first choice for wanting to show yourselves off, it seems. Nonetheless, it happily accommodated the 24,500 that attended the show over the weekend and the hangars had their wares and clubs on display throughout. Part of the aforementioned nous included a spotter's package across the weekend open to about 100 people or so. On the show days this saw not only spotter-only zones at the far ends of the crowdline but unrestricted access to the parked aircraft for the better part of an hour and a half before the public were allowed into the enclosure. Sadly, this did mean a few of the aeroplanes still had their covers on (including the French Avenger), but for the most part you had generally uncluttered shots of the aircraft - on the Saturday at least there were no barriers around the aircraft at all meaning you had very close access to them indeed, as did the ever-present reenactors who very gladly posed for photos with the machines. As for the zones on the crowdlines, if nothing else they meant you had a little more space from the public and got a good shot at the very occasional topside swing round onto the display line but didn't necessarily afford a huge advantage. With the sun only coming behind the crowd in the latter half of the display programme, the situation was the same for everyone in the morning, but by the end of the day the light was simply stunning. Melun's T-shaped runway arrangement led to some bizarre movements, with most of the jets using the East-West runway - and so directly perpendicular to the crowdline - except for the Alphajet Solo Display which took off on the North-South runway, lifting off very close to the end to follow into a rather superb and punchy display which wonderfully showed off the agility of the small jet to its maximum. This was the same runway used by pretty much all of the piston-powered aircraft, and with very little wind to speak of they tended to take off north and land south - it mostly seemed to be a matter of timing and convenience as to which aircraft used which runway. Well, what of the aircraft? The lineup could hardly be topped for a venue that isn't a famous collection home such as Duxford or La Ferté. There were many French aircraft that were worth travelling to see - such as the Vampire pair which admittedly gave a fairly lacklustre display but, as is the case these days, the chance to see classic jets is always welcome for British enthusiasts and their unannounced but doubtless unique formation with the Rafale M fourship and MS.760 Paris was a particularly fun moment in the display. The Provence-based Noratlas, the last of its kind left flying, was another Gallic highlight that put on a pretty sporty display for a transport type including a hefty Khe Sanh approach to finish - as was the BT-13A Vultee which came from Chambley, probably the most literally highly-polished aircraft there. 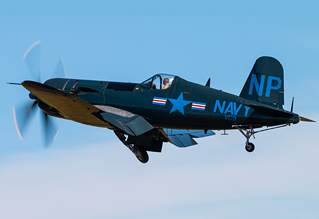 Added to this the likes of the La Ferté F4U-5NL Corsair which has hit the warbird circuit with a storm this year, as well as the usual French Yakovlevs and US fighters and you had a pretty good home team. But it was the was international participation that set Paris Air Legend apart, especially the very, very strong attendance from British operators. Notably Ultimate Warbird Flight's P-47D 'Nellie' made its first overseas display following its return to the UK this year, alongside its stablemates Buchons "Yellow 7" and "White 9". UK-based Hurricanes P2902 and P3700 joined their French sibling to make a trio of the type - a virtually unprecedented figure for a European show outside of the UK, and one which was given a good amount of reverence in the commentary. In fact, with two British Spitfires - the "Excaliber Sword of Liberty" as the commentary so floridly put it - also in attendance, it's unsurprising that in the souvenir programme the theme of the RAF's centenary was given a prominent section. With the last-minute addition of the Swiss Avenger, though, the headline act was set. For the first time in twenty years two airworthy Grumman Avengers took part in a European show. Parked next to each other in the aircraft enclosure, their sheer bulk meant they stood out from the others and there were literally queues to have a look inside the rear compartments, but in the air they were fantastic. Ok, they didn't quite fly in close formation on the Saturday, but they arrived on the display line accompanied by The Fighter Collection's Grumman Wildcat - three of Grumman's famous barrels together was a brilliant moment to put on. If there was anything missing from the show, it'd have to be some sense of identity unique to the event. 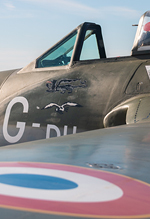 This is a hard call to make, and it's said with some reservation because character can't just be manufactured, especially for a first-time event, but the running order and the set-pieces were very, very familiar to anyone who'd been to La Ferté-Alais in May. With pared-down versions of the Tora! Tora! Tora!, Vietnam attack and even the transport formation (featuring the Noratlas, Flamant and two DC-3s this time), it was perhaps a little cookie cutter from the point of view of originality. Not that this is automatically a bad thing, these are great pieces, they work very well and absolutely don't lack for entertainment value but was simply very familiar, like it was working off the same template, which came as a surprise if nothing else due to the clear effort that had gone into other aspects of the show, and could do with some shaking up at the next event. 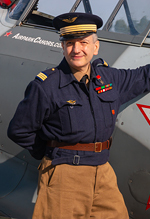 Unique aspects of the flying display were two salutes to French test pilots, the Alphajet Solo flying together with the P-40 to honour Constantin Rozanoff, and a PAF break to commemorate Jacqueline Auriol, both pilots having formidable CVs of French test flying and record breaking. In the future, perhaps more could be made of the "test pilot" aspect of the venue through EPNER, the French equivalent of the Empire Test Pilot School - this would certainly give the event a unique aspect that will strengthen its place on the European circuit. But ultimately, is a sense of identity a deal-breaker for a show when you're able to get together a stunning list of the continent's vintage scene? It was a cracking show - not without flaws, organisationally it felt a bit slapdash, but these are lessons to be learnt for the future - and the flying was very good. There's a reason so many people travelled for this event, either as spectators or participants - they aimed high with their first innings, and hit their target with no compromise on quality. Nothing you could call a filler act, no caravans or timeshares or whatever on sale in the showground - everything was top-tier aviation event in presentation, and yet the crowd was relaxed, comfortable. It had the feel of a families day with the quality of a triple-A airshow and that's no small achievement at all. The dates for the next edition have already been set at the 7th and 8th of September 2019. 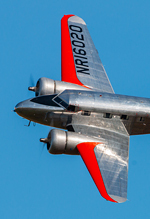 The organisers are certainly satisfied with the positive reception the show garnered on its first attempt, as Eric Janssonne, co-organiser of the Paris Air Legend informed UKAR: "We are pretty happy with the final result of this first edition of the Paris Air Legend. That is why we have decided to make this event recurrent on the European air shows landscape. 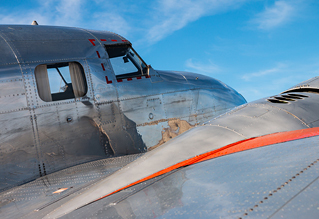 Because we had some nice echo in Europe, we also decided to make the Paris Air Legend an annual warbirds or jets collection rendez-vous, here, at Melun-Villaroche, each second weekend of September." JM Airshow have built themselves a very strong base with their first outing, and we're all excited to see what they can do next year - if this year's quality can be repeated, this particular show could well earn a place as a "must-go" event on the European calendar. Thanks to David Villeger for providing running translations of the commentary for the purposes of this review!